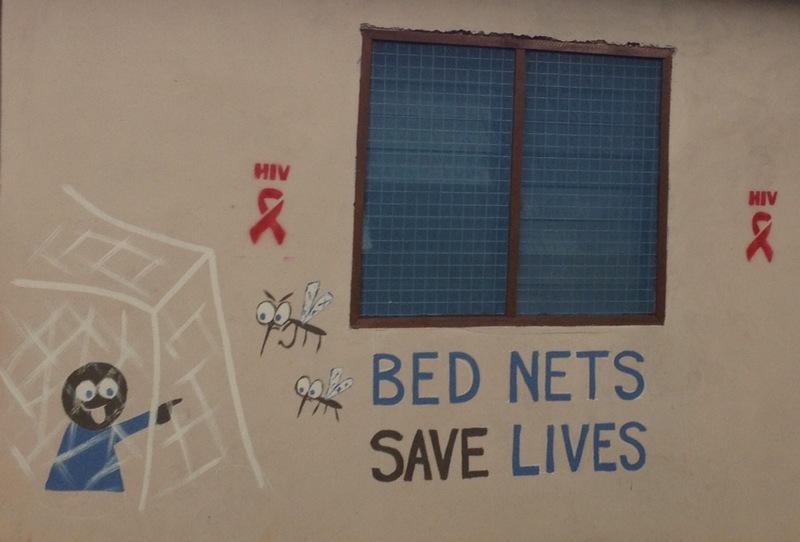 Malaria and Long-Lasting Insecticide Treated BedNets. After a few false starts late last year, my counterpart and I were finally able to procure and distribute 1200 mosquito nets in my town and surrounding villages. 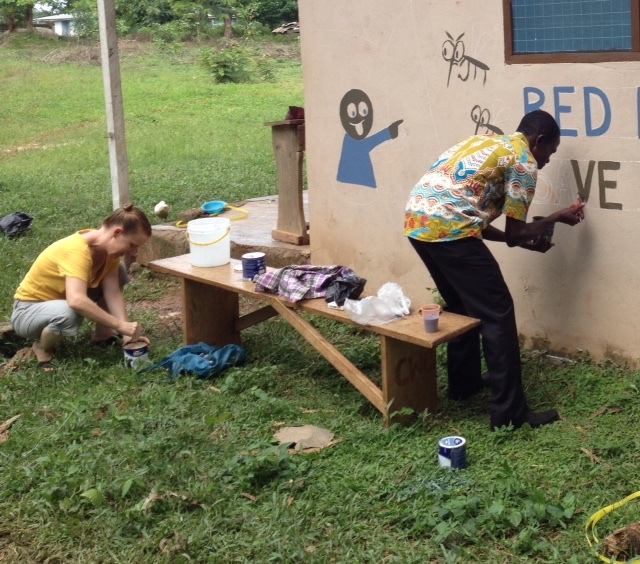 We began registering homes last September based on an proposed grant by a seasoned Peace Corps volunteer planning to secure nets for interested volunteers in the southern half of Ghana. Another volunteer had done the same in the northern half and their distribution came off last fall. As we began this plan before Christmas, I included information on its progress in my report to stake holders in my town last year. I sent my report to the chief and elders, the local government officials, the hospital administration, as well as local volunteers with whom I work. I spoke directly with folks in the hospital administration about our plans for registration and distribution. Recently, on occasion I would hear of a meeting at the hospital about their planning of a possible parallel bed net distribution, but I was never directly informed of these meetings or invited. A friend in the hospital administration told me rumors of Ghana Health Service obtaining 400 nets for pregnant women in my district (a population at significant risk), but I heard nothing more. The original southern bed net distribution did not come to fruition, so I ended up writing my own grant and just before Easter we were able to pick up the nets in Accra and have them transported back to my village (approximately 10-12 hours by truck). It was no small feat and I was happy to finally be able to follow through with our promises of mosquito nets to the registered people in our area. Mosquitos breed in still water and with the onset of the rainy season, and the subsequent massive, long-lasting puddles, mosquitoes were once again wreaking havoc in our area. It should have come as no surprise to me when after finally obtaining our 1200 nets we heard that Ghana Health Service also procured nets for the district. They received more than the rumored 400 for pregnant women, but rather they procured 29000 nets for the district! This number estimated offering one net for every two people living in the district. I was simultaneously thrilled that so many people might receive this form of protection and dismayed that our efforts could not be coordinated to better serve the population. We were working in parallel realms and did not find an intersection. My counterpart and I were able to distribute our nets before GHS had worked out their distribution system. For our nets, we had participants sign a commitment form promising to make use of the protective measure. When we went house-to-house to register the residents, we were careful to avoid offering nets where they had clearly been misused. Nets are routinely given away in Ghana and often not taken seriously, being used for fencing, screening, etc instead of their intended use of preventing mosquito bites while sleeping. In the upcoming weeks we will visit several homes of recipients to make sure their nets are hung and being used properly. We are hoping that based on our signed commitment forms, our visits might scare those not using their nets into action. I never thought of shame as a motivator before, but in a society where reputation is so important, keeping a good name for yourself is key. I am hoping that many of our nets will be put to good use and we are able to reduce the number of malaria cases in our area. I don’t believe GHS has the manpower or budget to do a similar check up. In this regard, I am happy to have the time to follow up with people and attempt to ensure their safety. Our numbers may be smaller than those offered by the national health service, but I feel secure in knowing that our nets will be put to good use and our clientele have been educated, not just about use and hanging of bed nets, but also about building soak-away pits to decrease incidences of standing water and other prevention techniques. Malaria is seen in similar terms to the flu by many Ghanaians. They get sick, with body aches, chills, vomiting, and then they head to the clinic where they are given medicine. What seems to be overlooked in this cycle is the lasting effects to the body. Repeated malaria causes anemia. Malaria in pregnancy can cause miscarriages or low birth weight. Severe malaria, when simple malaria goes untreated and advances, can lead to death, especially in young children. Malaria is serious. It presents like the flu, but it can be devastating to ones health. We are doing what we can to educate those in our community to take this illness more seriously. Pushing for behavior change is the hardest part of this job, but it is critical to the development of this country and I will keep working on this front as long as I remain in Ghana. Hopefully my efforts will make at least a small difference in the lives of those around me. This entry was posted in Uncategorized on May 29, 2015 by chrismtodd.